I drove through the park entrance and all of the sudden I felt transplanted back in Los Angeles. Bumper to bumper cars, construction, road closures and detours. Welcome to Spring Break in a National Park. Cosmo and I were set to meet at the South Kaibab Trailhead, a slightly less popular part of the park. However, when I arrived, a line of cars blocked our meeting spot. I quickly parked my car on the side of Highway 64 and stood close to the road in my bright coral-colored running shorts and red trucker hat, hoping to flag Cosmo down amidst the traffic chaos. After thirty minutes of anticipatory bouncing from one foot to the other, Cosmo slowed beside me, made a face, and found a parking spot. I did my best to remain calm and patient, but I felt like an excited puppy who’d just been let out of their cage. The sun would be setting in just a couple hours and after a day of driving, my legs were restless. Thankfully, Cosmo felt similarly. 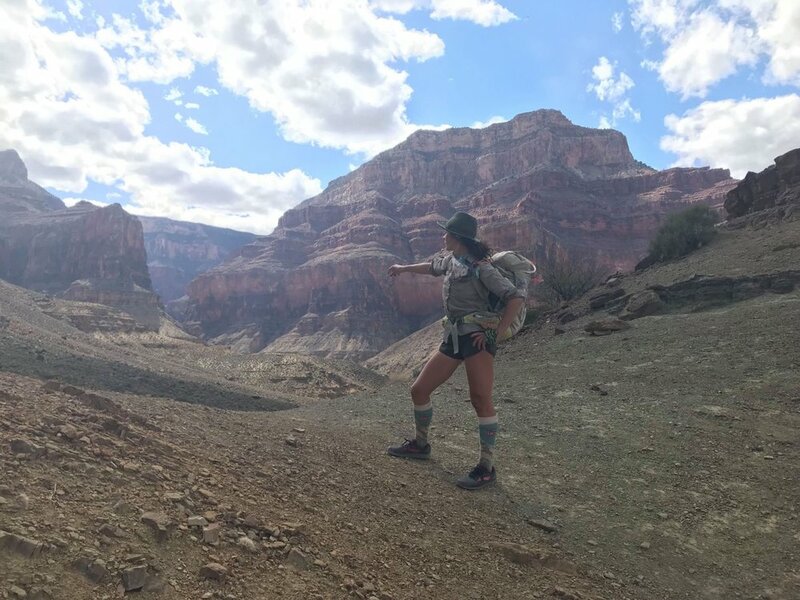 We said our hellos, attempted a conversation regarding backpacking plans, and agreed that little would be worked out until we satiated the urge to delve into the waiting Canyon. 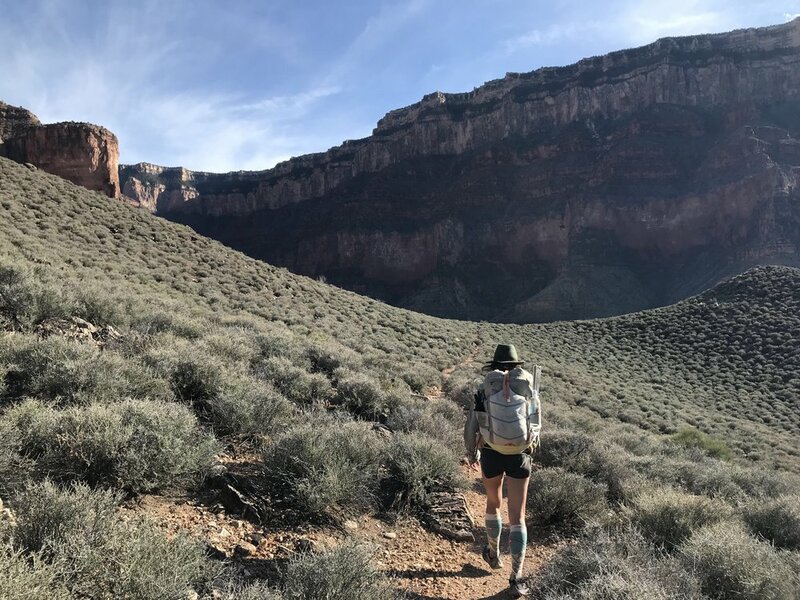 Ignoring better judgment, we took off down the South Kaibab Trail at 4:30pm to run Rim 2 River 2 Rim, an 18-mile route from the top of the South Rim to the Colorado River and back. By the time we reached the end of our run, at the top of Bright Angel Trail, darkness had long since fallen. We were fortunate to hitch a ride from a park employee back to our cars, where we enjoyed a night of indulgent glamping- cold beer, real food, and a roof for the midnight sleet storm. We tried to sleep in but were woken up by the occasional tourist car pulling in to the trailhead parking lot, taking a photo of the canyon scenery from their car seats, and then driving off. Neither of us got much sleep, but were excited to get away from the crowds and start our 5 day trek along the Tonto Trail. We stopped off at the Backcountry Ranger Station, and due to a predicted storm coming in a few days, changed our route slightly, with plans to now exit from the Hermit Trail rather than risking the potential washed out South Bass Trail. With our new permit in hand we dropped off one car at the Hermit Trailhead, packed our bags, and drove to the Tanner Trailhead to start our journey. Looking out at a the Grand Canyon feels surreal. The grandeur, the expanse, the layers upon layers of clay colors rocks walled around the winding Colorado River. It’s incredible. We marveled for a few minutes staring out at the lay of the land and then excitedly grabbed our packs to get in it! Every step of the hike is a panoramic view. It’s overwhelming. 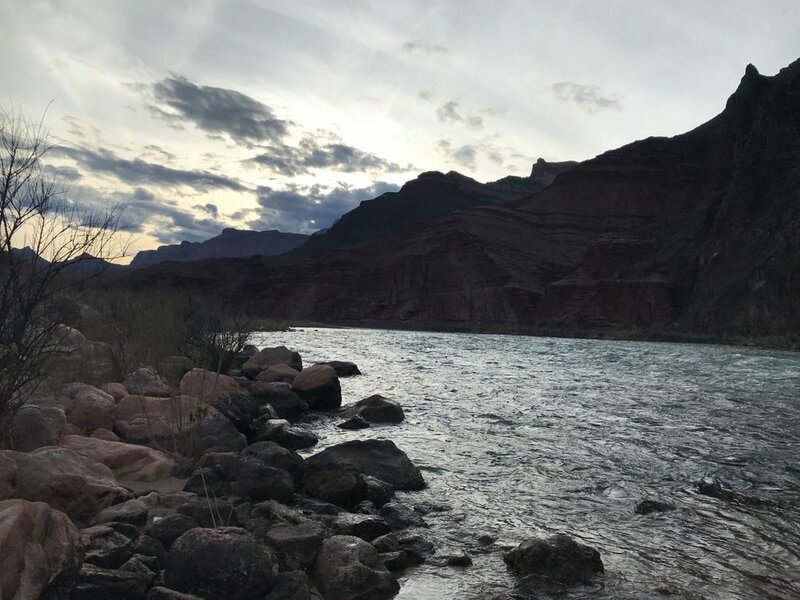 We hiked 8.5 miles down the Tanner Trail and arrived at Tanner Beach, at the banks of the Colorado river, just in time for sunset. We took a break by the water and ate an early dinner. After dinner, we hiked four more miles up and down canyons and along the Colorado River. We hiked into the night and set up camp under the stars. In the darkness, I felt a dramatic landscape surrounding us, though the light of the stars offer only mystery. 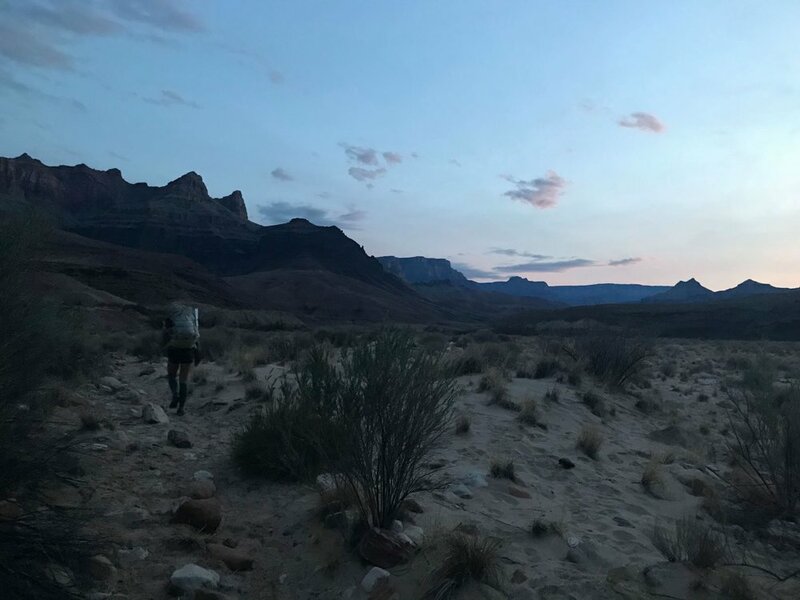 Away from the ramblings of the river, the silence was profound, and was broken this first night only by the call of coyotes at dawn and a startling rockslide further down the canyon. Before hitting the Tonto Trail from the East, we first were confronted with the notoriously challenging and tedious Escalante Route. However, it was only after crossing Seventy Five Mile Creek that we were met with any obstacle, soon finding ourselves in the middle of an arduous vertical scramble. The evening seemed to come quick, and the day’s hiking was surprisingly hard. By 8pm we had only gone 13 miles. The sky was dark and when we came to a perfect little open tent spot on a canyon platform, we couldn’t resist. We set up to cowboy camp, ate our dinner of veggie chili and mashed potatoes, and laid beneath the starry sky watching shooting stars fly through the Milky Way. We felt humbled, awed, and gratefully content with our bellies full. Today we hiked through the Grapevine Canyon, one of the longest and most complex canyons of the trail. Through the Grapevine, the Tonto is narrow and exposed. The views below are dramatic and mesmerizing, but it's important to remain aware of each step and stay safe. We started our hike with dark clouds lurking all around us. We walked in and out of scattered rain showers, strong winds, and at times, dime-sized hail. The day was much wetter and colder than the previous days, making the trail much more slick and scary with dramatic drop offs. As I hiked, I listened to a podcast about the negative effects of social media. A recent study found that social media decreases happiness. People spend less time engaging in meaningful relationships and activities, they become more sedentary in their lives, and self-esteem suffers when you are constantly in a state of comparing your life to others. Theodore Roosevelt said, “comparison is the thief of joy.” When I am in the city, I notice this in myself. I am not happy when I am glued to my phone. When I am in the wilderness I exist in a world without Wi-Fi, without cell phone service, and without social media. Out here, I am much more present, and content, in my experiences. I am less stressed and, in these moments I feel happiest. I know I don’t feel good when I am distracted and when I am constantly engaged in social media, and yet why is it still so hard to break free from these unhealthy habits when I am back home? How do I make the lessons I learn out on the trail part of my daily practice in my busy city life? We woke up to sunshine and clear skies. We celebrated the beautiful weather with long breaks throughout the day. It can be such a challenge to slow down sometimes, even out here. As we watched the river in its eternal wandering, we were reminded of the futility of our stresses and rushing - what will happen will happen. Walking through in and around the Grand Canyon never stops being incredible. We had panoramic views the entire way, and had the trail to ourselves in between corridor trail junctions. We noticed that the corridor trails tend to act like human corrals. The majority of park visitors stay on the South or North Rims, gazing out at the canyon but never venturing below. Later in the day we met other backpackers as we took a break to filter water. They reported that while we may have only had rain down here, the conditions of the roads on the rim have been snowy and slushy. We were aware that another storm was expected to come within the next day or so, and began to quicken our pace toward the Hermit Trail. By the evening we got to the trail junction of another popular corridor, the Bright Angel. We decided to check the latest weather report and develop a more serious plan for the rest of our hike. If we would need to get out of the canyon early due to the storm, this would be our chance. The weather predictions that were posted at Bright Angel said heavy snow would start tomorrow afternoon. We felt compelled to hike out via Bright Angel, but neither of us were ready to go. 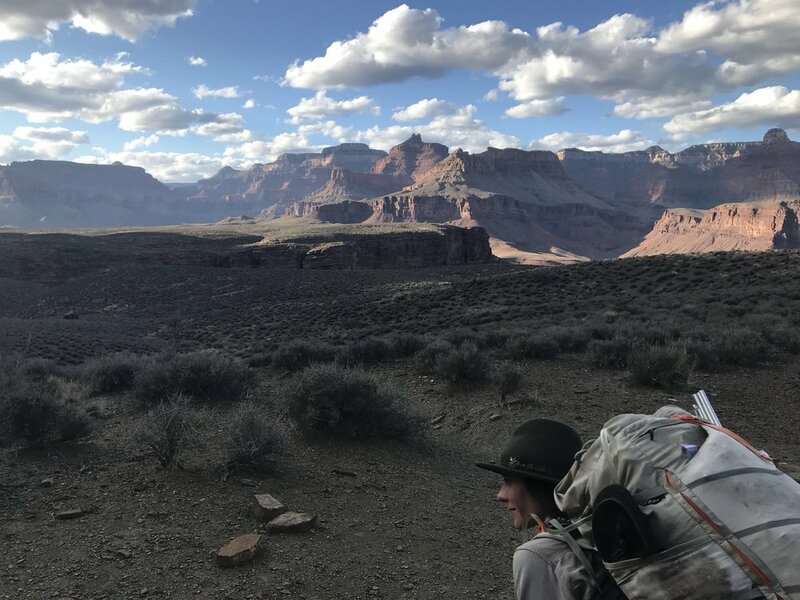 We left Bright Angel at 6:30pm, hiked a few more miles up the Plateau Point Traill and then West on the Tonto Trail to find a nice scenic spot to camp. 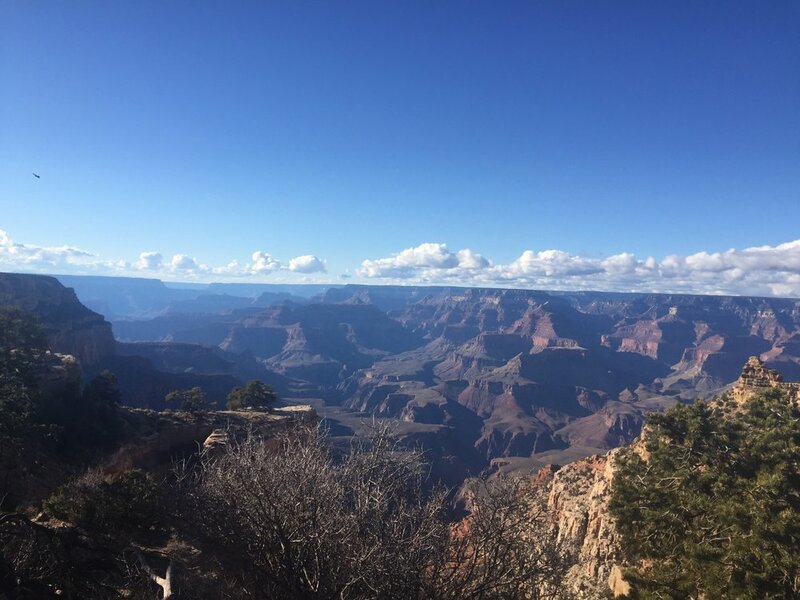 We figured we would stay fairly close to Bright Angel, take our time in the morning enjoying the canyon, and hike out before the snow would start. The week has gone by quickly. After dinner I laid down in my sleeping bag, listening to the wind smack against the tent, I tried not to think about this being our last night on trail. I woke up from a deep sleep feeling refreshed and optimistic about the day. The past couple nights I have fallen asleep more quickly and slept more deeply than I have in months. I feel rejuvenated. 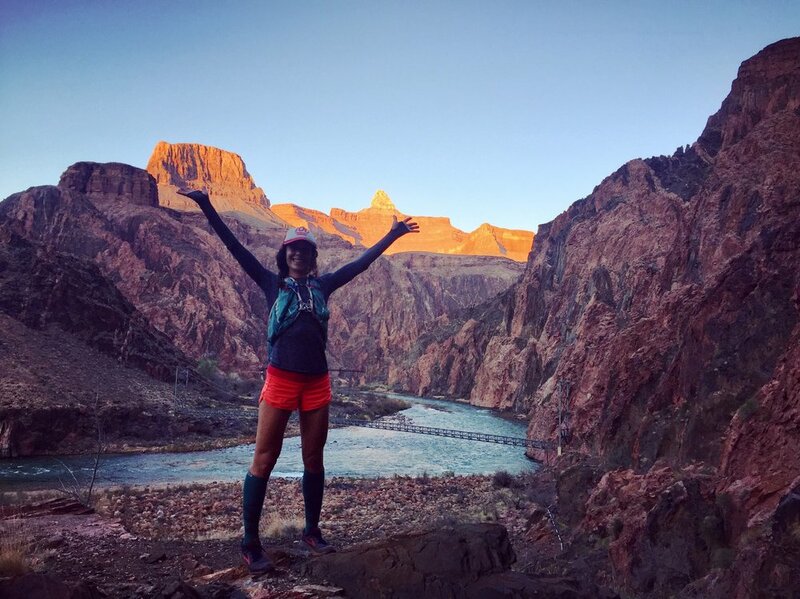 Although we talked about playing it safe and heading out early through the Bright Angel Trail, this morning the sun was shining and I had a hard time sticking to that plan. We had a few hours before the storm was predicted to roll in - so we kept going. We hiked for 10 miles on Tonto Trail West passing through Monument Creek and Granite Rapids. As we got closer to the Hermit Trail, the day got later and the clouds became thicker, darker, and much closer to us. Around 1pm we arrived at the Hermit Trailhead and passed a National Park Service worker who gave us another storm warning. To beat the snow we had to climb 4,000 (very steep) feet, in 3 hours. I gazed up at the climb ahead of us, the winding switchbacks carved out in the canyon seemed to just go on and on - I couldn’t see the top of the climb from where I stood. We had long passed our bail out spot, and there was no choice but to keep going. One foot in front of the other. The climb was relentless and intense, and we could feel the wind blowing sharply as we continued upward. Our breaks were brief as we took momentary collapses on the trail, hurrying to beat the snow. A couple miles below the rim we reached a rest point. As we got near the top of the climb, the blue sky started to disappear behind thick gray clouds. A brief journey away from civilization, away from rushing through days, small talk, societal rituals. With sunburns and dirt covering our bodies, we felt cleansed. We’ve watched each sunset and each sunrise, in full appreciation of the silence and profundity of these daily, godly occurrences, and it is not without a small bit of shame that I smilingly tap myself on the wrist for so often sleepwalking through these moments. We’ve done nothing but walk this past week, and in this simplicity, in allowing the complexes and constructs of our lives above the Rim to fall naturally by the wayside, we have become quiet. I am myself, centered in my insignificance of red-walled timelessness, silently ecstatic in this surreal beauty. As we neared the top of the Rim, we heard voices and saw people. A family of six met us excitedly, “Did you guys make it all the way down? We’re gonna try tomorrow but who knows with this weather coming, boy, can you feel the wind now! What a view though huh, this place sure is something. You folks have a good time? We’ve got a room booked at the lodge tonight, pretty sweet if you ask me. We never been here before, looking forward to seeing everything but we’ve only got a few days. They say you don’t wanna be going down to the river in one go but we say hey what the heck we’re in alright shape, let’s give it a go, where’d you come down anyway? We’re heading down the Hermit Trail, hear it’s a doozy though.” They bombarded us with questions, but left no time in between to wait for answers. Cosmo stared with a wide and distant look in his eye, nodding and providing appropriate (mostly non-verbal) responses. We sat in a cafeteria inside Grand Canyon Village and watched the storm roll in. We were grateful to be warm, dry, and with bellies full of vegan chili! 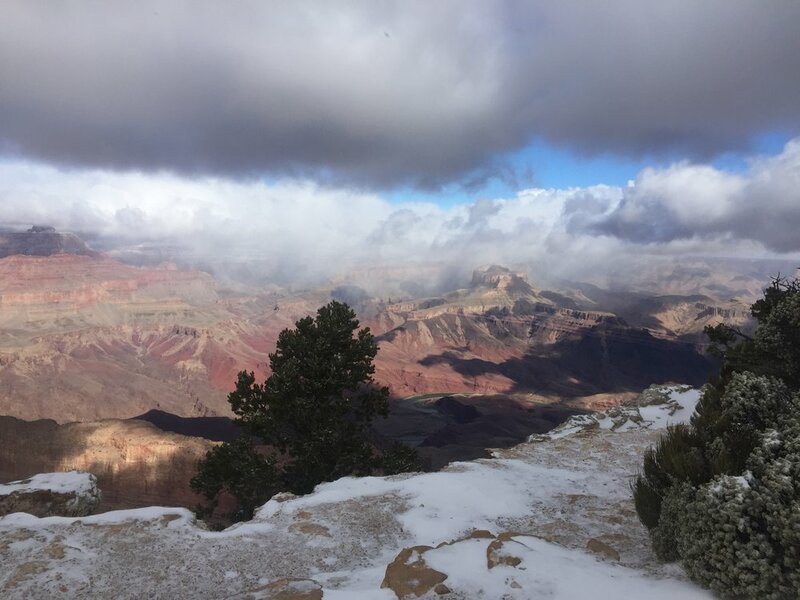 Earlier in the day we were hiking comfortably in shorts 4,000ft below the rim, but that night we car camped on the Rim and woke up to a snow-covered car and canyon. 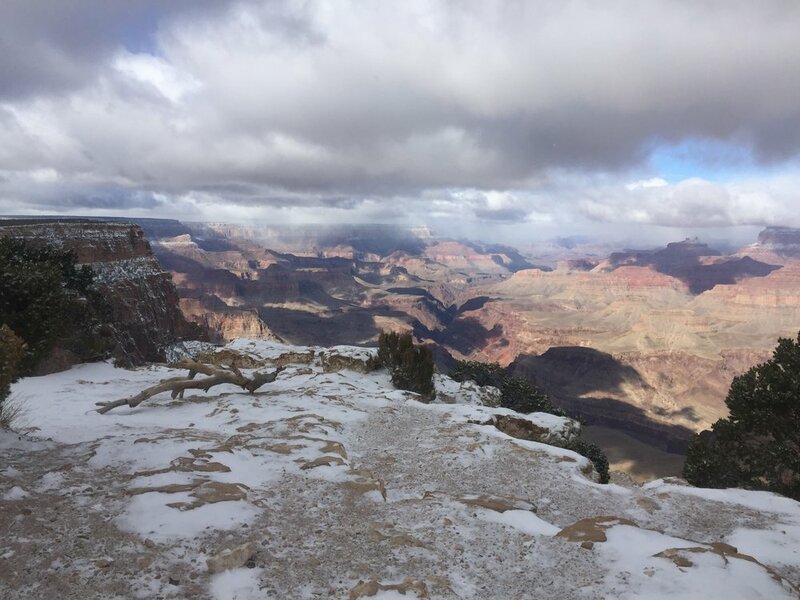 We car camped on the Rim and woke up to a surprisingly different view, a snow-covered car and canyon. In the morning we made coffee, and gazed out (astonished!) at an entirely different looking canyon covered in freshly fallen snow. We felt good with our hike, and looked forward for the next time we could return.